A clip from Hen Blant BachA programme, of which Bangor University was an integral part, has won a Silver Award in the 2018 New York Festivals International Film and Television Awards. Hen Blant Bach, a production by Darlun production company won the Award in the Community Portraits documentary category. 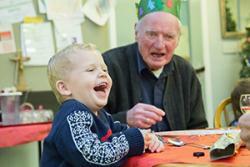 The series was a new factual format for S4C, and followed the social experiment which brought older people and nursery children together to share their day care. The programmes documented the transformative positive effects that can be brought about by bringing these two groups together. Congratulating the researchers and production company, Dr Penny Dowdney, KESS 2 Wales Manager commented that the popular programme had proven to be a fantastic example of how working with experts was enabling companies to develop new products. Sharing their insights in the programmes were Bangor University psychologist, Dr Catrin Hedd Jones of the School of Healthcare Sciences and Dr Nia Williams of the School of Education, seen on screen, and Prof Bob Woods. Under the watchful eye of the two psychologists, the viewers received an expert commentary on what happens when this age gap is bridged and the resulting positive effects. 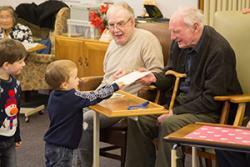 The latest series benefitted from the support of a KESS 2 Scholarship in partnership with Darlun. 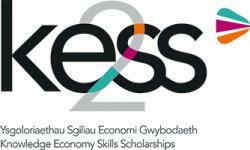 Knowledge Economy Skills Scholarships (KESS 2) is a pan-Wales higher level skills initiative led by Bangor University on behalf of the HE sector in Wales. It is part funded by the Welsh Government’s European Social Fund (ESF) convergence programme for West Wales and the Valleys. Hen Blant Bach has also been nominated for a Factual Entertainment Award in the Celtic Media Festival being held this year in Llanelli between 2-4 May.